Years ago it was bandied about quite a bit that the core sales technique of a large mainframe company was their ability to use FUD to win the business. Don’t know what FUD is? It’s an acronym for Fear Uncertainty and Doubt. It was an very effective process when used strategically to put competitors on the defensive and strong arm the prospect in making the ‘safe’ decision to go with the traditional ‘big’ company. It’s been used extensively by sales people since those days in the 70’s. Right now it seems to be rearing it’s ugly head in our world with the release of Windows 10 and how Dynamics CRM does or does not work with it. Let me be clear with what we know today based on official posts from Microsoft and the CRM product team. 1. Dynamics CRM 2011, CRM 2013, and CRM 2015 are supported on Windows 10 with the web client. The supported browser is Internet Explorer 11. 2. Support for Microsoft Dynamics CRM 2015 on the new Edge browser will be available for CRM 2015 with Update 0.2 (7.0.2) and Update 1.1 (7.1.1) in September. 3. Support for Microsoft Dynamics CRM 2013 via Edge will be introduced in Update Rollup 4 for Service Pack 1 (6.1.4). Here is where some confusion may be entering into the roadmap discussions and contributing to FUD. 1. Support for Dynamics CRM 2011 is available for IE 11. 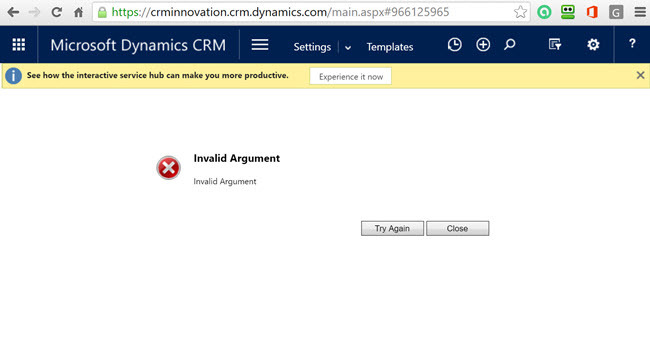 A complete browser reference for CRM 2011 for all major platforms is posted online. 2. CRM for Outlook for CRM 2011 and CRM 2013 does have a known issue with Windows 10 with IE 11 that unfortunately didn’t show up until very late in the Windows 10 release cycle. This prevents the CRM for Outlook client to install on Windows 10 machines. The CRM product team is aware of the issue and is working on a fix. There has been a workaround suggested on the community site which purports to solve the issue allow the installation successfully. I haven’t tried it myself but it has been verified as an answer by another community member. 3. Once Office 2016 releases, support will be available. If you would like to reference the original post you can do that here.